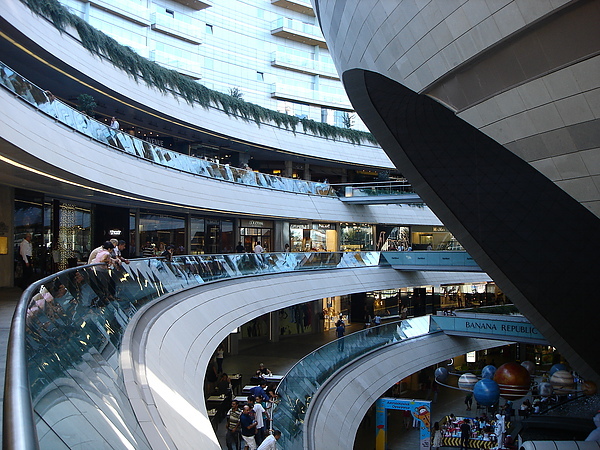 Kanyon Shopping Centre located at the posh district of 4. Levant, Istanbul, is a place for the rich and the privileged. Ordinary Turks actually do not shop there, as most of the shops are high-end department stores and expensive boutiques which only the very rich and affluent could afford. 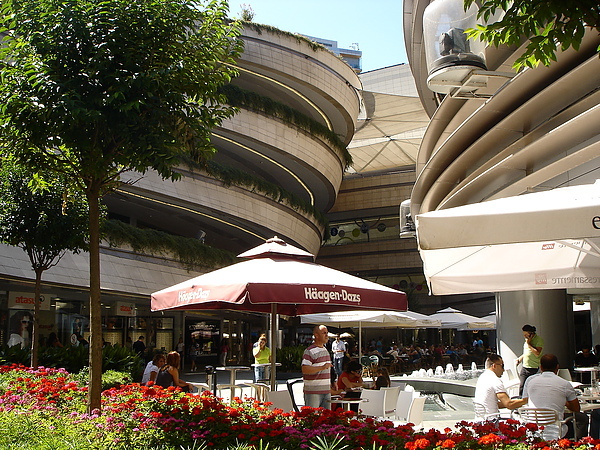 A visit to some of the shops in Kanyon can actually give you a lot of food for thought. Inside the posh Harvey Nichols (a branch of the well-known up-market department store in Knightsbridge, London), where a simple designer T-shirt comes with a price tag of more than 150 TL (about 75 euros), you would see expensive imported designer handbags and shoes with astronmical prices being snatched up by fashion-conscious Istanbulites within hours after the annual winter sales began. Given that the average salary and wage levels of most Turkish city dwellers are less than 700 TL a month, it actually reflects both the rising standards of living of the middle-class city dwellers on the one hand, and the huge income discrepancy between the haves and the have-nots. Usually one would not really expect any freebies when you shop at a place full of exclusive big-name boutiques, but foreign tourists are a rarity in this part of Istanbul, and whatever shop I enter, I was greeted with big smiles and lots of curious questions. The irony is, although this place is much more expensive than the touristy parts of Istanbul, I actually feel much more at ease strolling around from shop to shop here, because nobody in Kanyon would bother to hassle me or trying to sell me stuffs which I am not interested in. The staffs simply say hi to me, let me look at their merchandise on my own sweet time, and say good-bye with a smile, even though I left their shop without buying anything. Such a scenario is unimaginable in the infamous tourist trap a.k.a. the Grand Bazaar, where you almost never exit a shop in the Grand Bazaar without being talked/conned into buying something. Such hassle-free, no force-selling approach of up-market shops in Sisli, 4. Levant and Nisantasi is my preferred way of shopping. As a foreign visitor to Istanbul, I actually feel I am accorded much more repsect here than in the usual shops frequented by overseas tourists. 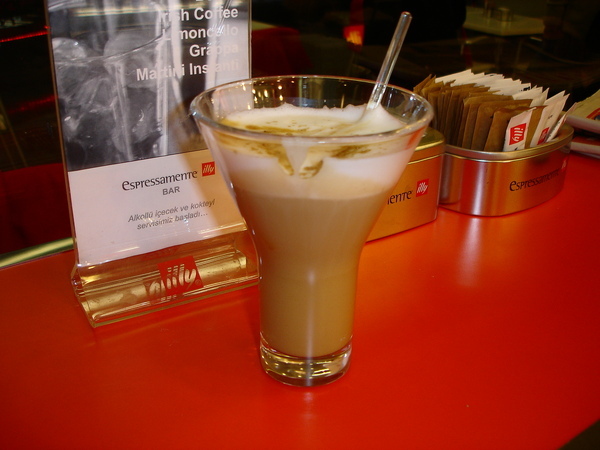 On a bitterly cold and snowy winter day, after doing my round of window-shopping in the Kanyon, I saw a newly opened Espressamente illy concept cafe on the ground floor. 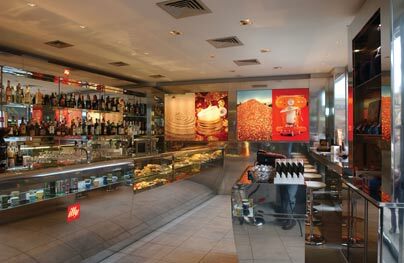 As a devoted fan of illy coffee beans, I decided to seek refuge there. There are two design concepts for Espressamente illy: the Silvestrin Model, and the Trazzi Model. 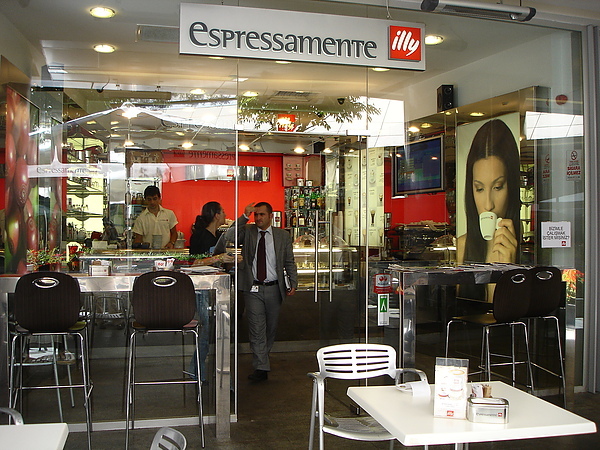 This particular Espressamente illy uses the 'Trazzi Model' concept of design, with illy's trademark red, silver and white colours as the main elements in the setup. As soon as I entered the cafe, the manager and the staffs greeted me and show me to a seat next to the window. The manager, a guy in his early 40s (but who looked somewhat older than his age), started a friendly chat with me. If you have been to Turkey often enough and long enough, you would immediately realise that he started the conversation not because he was trying to sell me something, but because he and his staffs were genuinely friendly. The manager explained that they seldom see foreign tourists at this part of Istanbul (as foreign tourists usually hang around in the tourist ghetto known as Sultanahmet) and they thought I must be living and working in Istanbul, or had at least lived for a while in Istanbul, as 'Kanyon is not on the itinerary of 95% of foreign tourists'. They became very excited when I told them my next stop would be Adana, as two of them came from Adana and they were eager to offer me their insider tips about what to see, where to go and what to do in Adana. Then one of the guys working at the Haagen-Dazs ice cream shop next door, who dropped by every 5 minutes to have a look at his girlfriend who also works at Espressamente illy, joined our conversation. Apparently he thought I must be some kind of relationship consultant, because he started telling about his troubled on-and-off relationship with his girlfriend. Just as I was busy dispensing my 5-cents' worth of advice to him, another Haagen-Dazs employee, also troubled by love, heard about my presence and decided to seek consultation with me as well. So with the help of Espressamente illy's Manager, who translated each and every word of our conversation (as none of the Haagen-Dazs employees speaks sufficient English to have an effective conversation and my Turkish is not much better), I spent the next 2 hours discussing with them their respective relationship problems, while sipping my latte macchiato in a pretty illy latte glass. It turns out that the second Haagan-Dazs guy is secretly in love with a girl working at a store around the corner, but he is too shy to tell her how he feels about her. He is afraid the girl might reject him out of hand, or worse still, the girl's father might come after him and give him a thrashing on the head. Although it's an open secret among his fellow co-workers, he still cannot find the courage to chat her up. Since I am a complete stranger from a non-Turkish background, he actually felt relieved to be able to confide his feelings in someone who is only there for a short while. Copyrights 2009. All rights reserved. Text by YC Cheng.